Marisa Tomei Supports 'The Chaperone' Cast at Hollywood Premiere! Marisa Tomei keeps it chic and casual while hitting the red carpet at the Los Angeles premiere of The Chaperone held at Linwood Dunn Theater on Wednesday (April 3) in Hollywood. 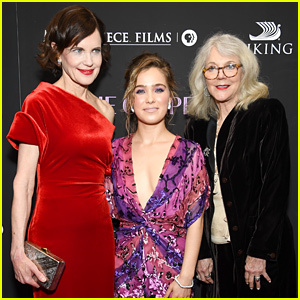 The 54-year-old actress stepped out to support the stars of the film Elizabeth McGovern and Victoria Hill. Synopsis: In the early 1920s, a Kansas woman finds her life forever changed when she accompanies a young dancer (Haley Lu Richardson) on her fame-seeking journey to New York City. Also in attendance were producer of the flick Rebecca Eaton and Downton Abbey actress Lesley Nicol.